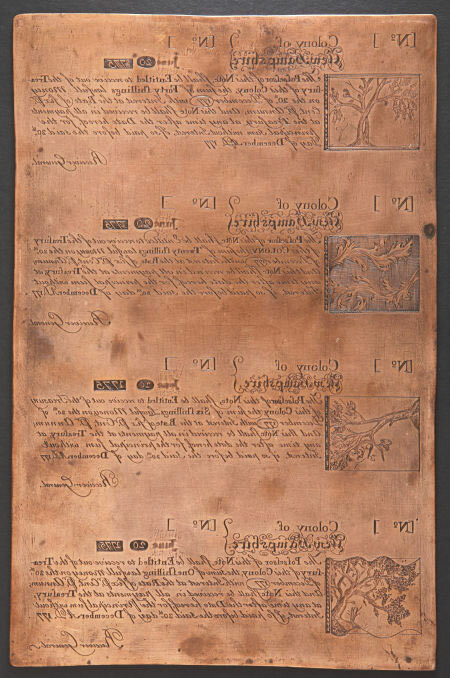 DALLAS, TX — A very rare New Hampshire Colonial Copper printing plate — long believed to have been engraved by Paul Revere, but now known to have been engraved by John Ward Gilman — dating to June 20, 1775, is one of the principal highlights of the Heritage Auctions’ Signature® ANA Currency Auction, Aug. 11-16, in Boston. The New Hampshire June 20, 1775 40s; 20s; 6s; 1s Copper Printing Plate was believed, for many years, to be the engraving work of Paul Revere, and there was certainly plenty of circumstantial evidence to corroborate that conclusion. The striking similarities of form, layout and style of the New Hampshire July 20, 1775 plate to two Massachusetts copperplate issues of May 25 and July 8, 1775, certainly lent credence to that belief. The New Hampshire June 20, 1775 paper money issue was authorized by the New Hampshire Provincial Congress on June 9, 1775 and was mandated to be similar in form, style and content to the Colony of the Massachusetts Bay’s copperplate issue of May 25, 1775, presumably as a means to facilitate acceptance and circulation of the notes. Documentary evidence has established that Revere created the two Massachusetts issues. However, there have been no known primary sources connecting Revere to the production of the New Hampshire issue; all links have been circumstantial, relating to form, style and content. 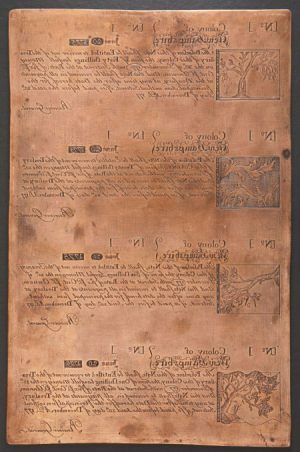 The first document shows committee authorization of payment to John Ward Gilman of £13 for the acquisition and engraving of the copper plate, and the printing of the notes. The second document is John Ward Gilman’s account to the committee itemizing his various efforts to produce the printing plate, acquire and prepare the press, and perform the actual task of printing, for which he was paid the £13 sum listed in the first document. The vignettes contained within each engraving were later modified circa 1855 by an unknown hand. The copper printing plate will be offered as Lot 12222 during Session One of the Heritage auction. The session will begin on Wednesday evening, Aug. 11, at 6 p.m. ET. Detailed information concerning the plate, its history, and supporting documentation may be viewed at HA.com. The Boston auction will include three floor sessions and an online session. Lot viewing will be conducted at the Hynes Convention Center, Room 210, 900 Boylston St., Boston, MA 02115 and the floor sessions will be held at the Hynes Convention Center, Room 203, 900 Boylston St., Boston, MA 02115. In addition to lot viewing in Boston, a preliminary lot viewing will take place at Heritage Galleries Beverly Hills, 9478 W. Olympic Blvd., Suite #100, Beverly Hills, CA 90212 on Friday, July 30, 2010 and Saturday, July 31, 2010. The Non-Floor Session will be available for viewing in Boston and closes on Heritage Live on Monday, Aug. 16, beginning at 12:00 p.m. CT. Over 1400 lots will be offered during that session.